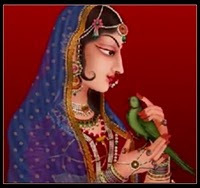 In Sanskrit the parrot is also known as suka. When a ripened fruit is cut by the red beaks of such birds, its sweet flavor is enhanced. The Vedic fruit which is mature and ripe in knowledge is spoken through the lips of Srila Sukadeva Gosvami, who is compared to the parrot not for his ability to recite the Bhagavatam exactly as he heard it from his learned father, but for his ability to present the work in a manner that would appeal to all classes of men. link: http://en.wikipedia.org/wiki/%C5%9Auka - Śuka was the son of the sage Vyasa (credited as the author of the Vedas and Puranas) and the main narrator of the Bhagavata Purana. 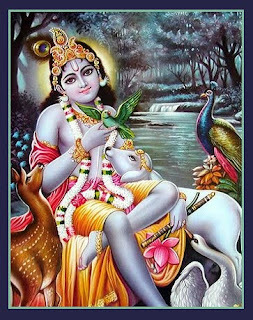 Srila Sukadeva Gosvami was actually the dear parrot of Srimati Radhika – Sriyah Suka. Sriyah means ‘of Radhika’. 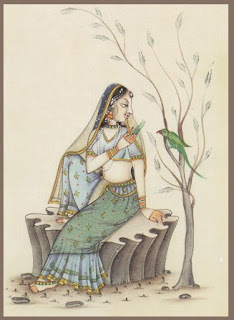 One day, Srimati Radhika was feeding pomegranates to that parrot. She placed him on Her hand and told him, “O Suka, say ‘Krsna, Krsna, Krsna.’” The parrot repeated, in the same very sweet and melodious tune and voice as Srimati Radhika's: “Krsna, Krsna, Krsna”. He then saw that a very beautiful parrot was sitting on the tree. He very sweetly called to the parrot, “Come on, come on,” and the parrot at once came to sit on His hand. They began to call the parrot, but he did not come. They told Krsna, “If any living entity comes to You, he will get Your affection and never go anywhere else. If Srimati Radhika comes and calls him, only then will he come; otherwise not. 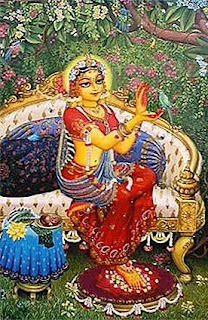 link: http://en.wikipedia.org/wiki/Radha - Radha, the main companion of Krishna.